WELCOME! 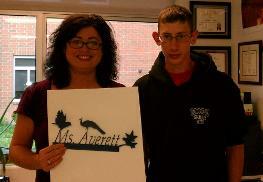 This website is designed to help Mrs. Averett's students be successful. Here you will find course information, online resources, class notes, assignments and worksheets for your Honors Biology class. General Information for all classes can be found here. To accomplish this goal it is my desire to help students become aware of seven crosscutting concepts that span the various disciplines of science, to learn how to participate in eight fundamental scientific practices and to learn about the core ideas in the life sciences. Do more than listen, understand. The deadline for all late, missing and absent work assigned between August 16 and September 1 is September 8. You will need to make up all assessments in Voluntary Tutoring during JAM no later than September 8. Please sign up for Voluntary Tutoring in a timely fashion to ensure all items will be completed on time. All work from these dates must be made up and submitted by this deadline to receive credit. The deadline for all late, missing and absent work assigned between September 5 and September 22 is September 29. You will need to make up all assessments in Voluntary Tutoring during JAM no later than September 29. Please sign up for Voluntary Tutoring in a timely fashion to ensure all items will be completed on time. All work from these dates must be made up and submitted by this deadline to receive credit. The deadline for all late, missing and absent work assigned between September 25 and October 6 is October 12. You will need to make up all assessments in Voluntary Tutoring during JAM no later than October 12. Please sign up for Voluntary Tutoring in a timely fashion to ensure all items will be completed on time. All work from these dates must be made up and submitted by this deadline to receive credit. The deadline for all late, missing and absent work assigned between October 9 and October 27 is November 3. You will need to make up all assessments in Voluntary Tutoring during JAM no later than November 3. Please sign up for Voluntary Tutoring in a timely fashion to ensure all items will be completed on time. All work from these dates must be made up and submitted by this deadline to receive credit. The deadline for all late, missing and absent work assigned between October 30 and November 10 is November 17. You will need to make up all assessments in Voluntary Tutoring during JAM no later than November 17. Please sign up for Voluntary Tutoring in a timely fashion to ensure all items will be completed on time. All work from these dates must be made up and submitted by this deadline to receive credit. The deadline for all late, missing and absent work assigned between November 13 and December is December 8. You will need to make up all assessments in Voluntary Tutoring during JAM no later than December 8. Please sign up for Voluntary Tutoring in a timely fashion to ensure all items will be completed on time. All work from these dates must be made up and submitted by this deadline to receive credit. The deadline for all late, missing and absent work assigned between December 4 and December 8 is December 15. You will need to make up all assessments in Voluntary Tutoring during JAM no later than December 15. Please sign up for Voluntary Tutoring in a timely fashion to ensure all items will be completed on time. All work from these dates must be made up and submitted by this deadline to receive credit. The deadline for all late, missing and absent work assigned between December 11 and December 19 is January 5. You will need to make up all assessments in Voluntary Tutoring during JAM no later than January 5. Please sign up for Voluntary Tutoring in a timely fashion to ensure all items will be completed on time. All work from these dates must be made up and submitted by this deadline to receive credit. The deadline for all late, missing and absent work assigned between January 3 and January 26 is February 2. You will need to make up all assessments in Voluntary Tutoring during JAM no later than February 2. Please sign up for Voluntary Tutoring in a timely fashion to ensure all items will be completed on time. All work from these dates must be made up and submitted by this deadline to receive credit. The deadline for all late, missing and absent work assigned between January 29 and February 16 is February 23. You will need to make up all assessments in Voluntary Tutoring during JAM no later than February 23. Please sign up for Voluntary Tutoring in a timely fashion to ensure all items will be completed on time. All work from these dates must be made up and submitted by this deadline to receive credit. The deadline for all late, missing and absent work assigned between February 19 and March 2 is March 8. You will need to make up all assessments in Voluntary Tutoring during JAM no later than March 8. Please sign up for Voluntary Tutoring in a timely fashion to ensure all items will be completed on time. All work from these dates must be made up and submitted by this deadline to receive credit. The deadline for all late, missing and absent work assigned between March 5 and March 23 is March 29. You will need to make up all assessments in Voluntary Tutoring during JAM no later than March 29. Please sign up for Voluntary Tutoring in a timely fashion to ensure all items will be completed on time. All work from these dates must be made up and submitted by this deadline to receive credit. The deadline for all late, missing and absent work assigned between March 26 and April 20 is April 27. You will need to make up all assessments in Voluntary Tutoring during JAM no later than April 27. Please sign up for Voluntary Tutoring in a timely fashion to ensure all items will be completed on time. All work from these dates must be made up and submitted by this deadline to receive credit. The deadline for all late, missing and absent work assigned between April 23 and May 11 is May 18. You will need to make up all assessments in Voluntary Tutoring during JAM no later than May 18. Please sign up for Voluntary Tutoring in a timely fashion to ensure all items will be completed on time. All work from these dates must be made up and submitted by this deadline to receive credit. The deadline for all late, missing and absent work assigned between May 14 and May 23 is May 25. You will need to make up all assessments in Voluntary Tutoring during JAM no later than May 25. Please sign up for Voluntary Tutoring in a timely fashion to ensure all items will be completed on time. All work from these dates must be made up and submitted by this deadline to receive credit. Students will need to have all materials by Friday 17 August 2018. Students are encouraged to bring all items the first day of school if at all possible. Loose notebook paper to be kept in the binder. 24 pack of colored pencils. Please write name on box. Pack of pencils. Please write name on package. Pack of blue pens. Please write name on package. Students are encouraged to bring all class materials beginning the first day of school if at all possible. Students will need to have all materials by Friday August 17, 2018 at the latest. ***Starting a new school year can be expensive. If these materials prove to be a financial burden please let me know! By working together we will make sure every student is prepared and ready to succeed this year! Each student starts the day with the same number of hours. But some get more done than others. What’s their secret? They manage time well! Look ahead: Use a monthly calendar to fill in test dates, project due dates, practices, events, and work schedule. By glancing over it as you add items, you can see how your weeks are filling up and plan accordingly. For instance, if you have a lot going on the same week a project is due, you might aim to finish a week sooner or find someone to take a work shift for you. Eliminate time-wasters: Pay attention to what you tends to do to avoid studying, such as playing video games, texting or watching TV. Then, you can identify if an activity is a “must do” or a “want to do”—and use the “want to” activities as rewards for finishing the “musts.” For example, you might tell yourself that you can check your phone/twitter or play a game after you have completed your work. This will help you stick to the task at hand. If you are constantly checking your phone you are not really studying!!!! Put your phone away and promise yourself you will not check it until you have completed a task or studied UNINTERRUPTED for at least 20 minutes. Be realistic: High school homework and studying should generally take a couple of hours each day. So if you have soccer practice until dinnertime, you probably can’t also meet a friend for smoothies or go to a movie. If you finds yourself routinely squeezed for time, you should reevaluate your commitments and cut back. You will need to make up all assessments in Voluntary Tutoring during JAM no later than given date. Please sign up for Voluntary Tutoring in a timely fashion to ensure all items will be completed on time. Remember, Voluntary Tutoring is only available for Freshmen on Mondays and Thursdays. Plan accordingly. If you are enrolled in RTI during JAM or are an FMP it is your responsibility to discuss this with Mrs. Averett and schedule an alternative time to complete missing assessments. All work from these dates must be made up and submitted by this deadline to receive credit. Content and study skill tutoring is available weekly after school with Mrs. Averett beginning at 2:40pm. You do not need to sign up for these tutoring sessions - they are open to all of my students. Please check the front board or contact Mrs. Averett for tutoring dates. Quick Quizzes, Quests and Tests must be made up during Voluntary In School Tutoring during JAM everyday except Wednesdays. Freshman are only eligible for this service on Tuesdays and Thursdays. The school Media Center (library) is open daily from 7 a.m. until 3:30 p.m daily. Students can access computers, printers, email, internet and additional resources before and after school. The function of education is to teach one to think intensively and to think critically... Intelligence plus character – that is the goal of true education. When homework says to "study" a topic or process the expectation is that you will critically read, understand and learn the material. This included learning how to define and correctly spell vocabulary terms. When homework says to "review" a topic or process the expectation is that you have all ready begun "studying" this material and you should make sure you really KNOW the material at hand. If you do not yet know the material you should go back over it, critically read the information provided, understand and then learn the material. High school means more classes to juggle--and more homework assignments to manage. Be successful in school by getting into a good homework routine and sticking with it. The result will be better grades and strong time-management skills and organizational skills to carry throughout life. To find more suggestions, click here. Each night students should spend 20-40 minutes critically reading, understanding, and learning the material we covered today, as well as reviewing material previously covered this year. I highly recommend progressive studying. This is studying past and current material together to increase your chances of remembering and being able to use the course content on unit tests and exams. For example, on Monday you study Monday's notes. On Tuesday, you review Monday's notes and study Tuesday's notes. On Wednesday, you review Monday and Tuesday's notes and study Wednesday's new material....etc. If you follow this method of studying, by the time we get to a unit test, you won't have to "cram" the night before and you will perform better on the assessment. ■ Ask questions before leaving school. That way, you can get started more quickly at home. If you realize later you’re missing information, contact a classmate—and move on to another assignment while waiting for a response. ■ Chip away at work. Shorten your to-do list by taking advantage of in-class work time and study halls. Or read textbook chapters, review notes, and do math problems while waiting for after-school meetings to begin. ■ Tackle assignments in an order that suits you. You might start with the toughest one so your mind is alert. Or begin with a favorite subject to get yourself going.